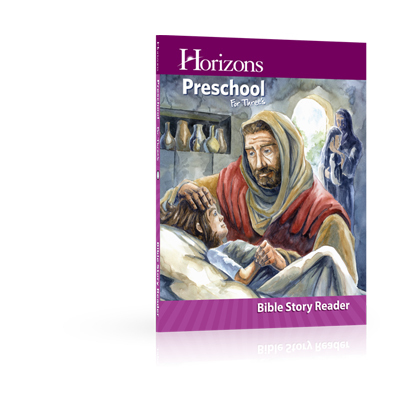 The Horizons Preschool for Three's Bible Story Reader introduces children to 40 of the Bible's best known and loved stories. A collection of 20 Old Testament and 20 New Testament selections, this reader includes hand-painted, original illustrations that bring the Bible to life for young children, as well as engaging questions that help them relate to the stories. The Horizons Preschool for Three's Bible Story Reader introduces children to 40 of the Bible's best known and loved stories. A collection of 20 Old Testament and 20 New Testament selections, this reader includes hand-painted, original illustrations that bring the Bible to life for young children, as well as engaging questions that help them relate to the stories. Each Bible story also concludes with a prayer. A new Bible story is presented each week, and the Student Workbook contains at least one activity for each story. The reader takes children from Creation to the life of Christ and The Great Commission. Stories include "The Tower of Babel," "David and Goliath," "Jonah and the Big Fish," "Jesus Walks on the Water," and "Jesus' Resurrection." The reader also shares the stories of memorable characters like Hannah, Samuel, Esther, and Zacchaeus.